Go Green - B.Gallant Homes Ltd.
B.Gallant Homes has committed to constructing homes that are high performance with low operating costs. Your home must work as a system to ensure a comfortable and energy efficient living environment. Gallant Homes strives to construct high-performance and architecturally distinctive homes using green building practices and state of the art virtual modelling technology. Structural Insulated Panel Roof Systems are composed of extruded polystyrene foam (EPS) between two sheets of oriented strand board. They come in different thicknesses with various predictable insulation values (based upon the value R 4 per inch of thickness). These sandwich panels provide 2-3 times the strength of a traditionally built roof, because they have the properties of a continuous column or I-beam. These panels don’t twist, warp or crack. 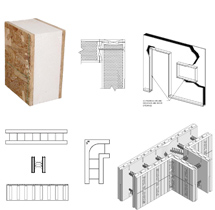 Insulated Concrete Forms are lightweight, highly durable foam blocks or forms composed of an extruded polystyrene, and recycled materials. The product is stacked in the shape of your home, reinforcing steel is placed inside and concrete poured in between to create a solid structural wall. Recycled material components that save in average 15 trees per home when constructed. Our local rain forest climate does not limit passive solar use. It is the great untapped potential for heating comfort. It does however require a different professional approach. If you want a healthy, cost effective, comfortable system for heating your home, radiant heating is the best option. Tubing in the floor level is optimal. Preferably in some thermal retentive material like cement. Radiant, passive solar and solar collection is not only for newly constructed homes. While it is true the overall performance may not match that of a carefully designed new home, highly productive energy collection and retention are possible through renovation. Read about our current Platinum Level Built Green Project here.